The Sheep’s Head Way walking route. The Sheep’s Head / Muntervary Peninsula (Rinn Mhuintir Bháire) is the smallest of the five Southwestern Peninsulas, and exceptionally unspoiled. A wild and boggy chain of hills cloaked in heathland rises from sweet green pastures where sheep graze peacefully to the summit of Seefin Hill (344m). Fuchsias and honeysuckle scramble over crumbling stone walls, yellow gorse dots the landscape and there are breathtaking vistas across the sea to the neighbouring headlands. At the lighthouse at the tip of the peninsula you will feel as if you are on the edge of the world, with only the ocean beyond. Durrus on ByRoute 1 is an ideal place to start or end a tour of this peninsula. Durrus Cheese is a superb washed rind cow’s milk cheese invented by Jeffa Gill in 1979 and made by traditional methods in the valley of Coomkeen, where local herds provide the raw milk needed to make it. Ahakista (Atha Ciste) is a mere scattering of mostly old houses in the pretty wooded coastal area around Ahakista House; it has a tiny primary school and a small but well sheltered fishing harbour. Ahakista Pier is the focus of much watersport activity in summer, especially for the Ahakista Regatta, held every August Bank Holiday weekend. Arundel’s is a quiet old pub where visitors can sit outside and enjoy the view overlooking Dunmanus Bay while sipping a pint. The Ahakista Bar, affectionately known as the Tin Pub due to its corugated iron roof, has a lush beer garden that runs right down to the water’s edge. Ahakista used to be famous for a wonderful (and expensive) restaurant, Shiro, for many years the only Japanese eatery in the West of Ireland, sadly closed in 2001 due to the demise of its owner / chef, Kei, who apart from preparing Sushi and other delicious dishes, specialised in Japanese watercolour calligraphy and paintings. Her elderly husband, Werner Pilz from Berlin, presided over each evening’s single sitting at the communal table, and loved to tell stories from his exciting life, during which he had bought a yacht from the prince of Hohenzollern, sailed around the world, smuggled diamonds, bought a goldmine, and lived in many exotic places. The restaurant’s Guest Book contained some remarkable signatures. Writer, playwright and screenplay author Wolf Mankovitz lived in Ahakista until his death in 1998. St Patrick’s church (RC) at Rusnacahera was built in 1836. The folly at Drumnea was commissioned in 1847 as relief work during the Great Famine by Lord Bandon, who owned much of the district. A Memorial Garden & Sundial donated by the people of Canada, India & Ireland stands in memory of 329 passengers and crew of Air India flight 182 from Toronto to Bombay, killed when a terrorist bomb destroyed their Jumbo Jet off this coast in 1985. A commemoration is held each year on 23rd June at 8:00 am. Kilvarock Garden has been planted with a range of southern hemisphere plants to take full advantage of the temperate climate of West Cork, and features an oriental area with ponds and bridges, a small orchid house, a pergola, a summer house, a courtyard Mediterranean garden with a campanile, and a tranquil woodland garden. Farranamanagh Lake is a beautiful spot overlooked by a ruined castle that belonged to the O’Mahony clan’s hereditary bards the O’Daly clan, who are said to have run a poetry school nearby. According to legend, two sons of the King of Spain were drowned in the lake. Cois Cuain Garden is entirely within 30m of the sea, and has extensive south-facing rockeries and many rare southern hemisphere plants. Kilcrohane is the peninsula’s Centre of Civilisation, with a post office, a community hall, a church (RC), and a primary school. The village takes its name from a ruined C8th church dedicated to Saint Crohan, who is believed to have been a contemporary of Saint Patrick. Kilcrohane pier is a popular place in summer for bathers and watersports enthusiasts. Boats take visitors to fish in Dunmanus Bay and greet the seals on Carbery Island. The church of Mary, Star of the Sea (RC) was completed in 1892. Kilcrohane was home to the great writer JG Farrell, and actor Ralph Ffiennes also lived in the village for a part of his childhood. The Alice West Centre, a museum focusing on the life and art of the late Alice West, who bequeathed her estate to the community, is due to open soon, with displays of local artifacts, crafts, and artwork. The Ceoil on the Coast is Kilcrohane’s traditional music festival, which takes place annually on Easter weekend, drawing musicians and enthusiasts from all over the country and abroad. The Kilcrohane Carnival festival held annually in the last week of July features sports days, dances in the local hall and a fishing competition. The Sheep’s Head Café is situated at the very end of the Peninsula, near the striking Lighthouse. The Goat’s Path is a magnificent drive over Seefin Hill and along the southern shore of Bantry Bay, connecting Kilcrohane and Bantry. 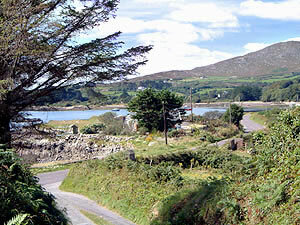 Bantry on ByRoute 1 is an ideal place to start or finish a tour of this peninsula.